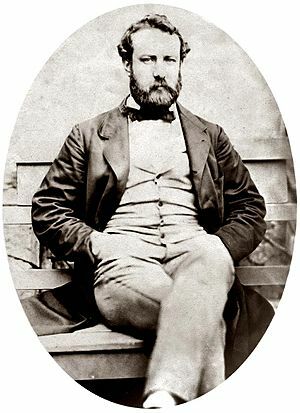 Jules Gabriel Verne (8 February 1828 – 24 March 1905) was a French novelist, poet, and playwright. Verne was born in the seaport of Nantes, where he was trained to follow in his father's footsteps as a lawyer, but quit the profession early in life to write for magazines and the stage. 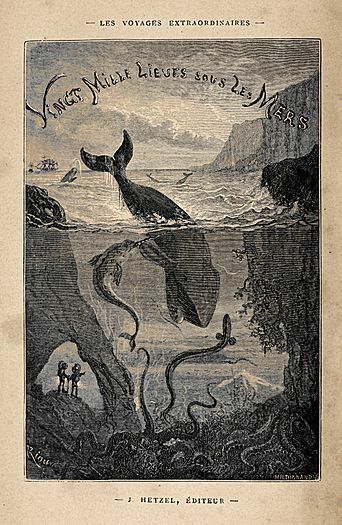 His collaboration with the publisher Pierre-Jules Hetzel led to the creation of the Voyages extraordinaires, a widely popular series of carefully researched adventure novels including Journey to the Center of the Earth (1864), Twenty Thousand Leagues Under the Sea (1870), and Around the World in Eighty Days (1873). Verne is generally considered a major literary author in France and most of Europe, where he has had a wide influence on the literary avant-garde and on surrealism. His reputation is markedly different in English-speaking world, where he has often been labeled a writer of genre fiction or children's books. Jules Gabriel Verne was born on Île Feydeau, a small artificial island on the Loire River within the town of Nantes. His parents were Pierre Verne, an attorney originally from Provins, and Sophie Allote de la Fuÿe, a Nantes woman from a local family of navigators and shipowners. In 1829, the Verne family moved and Verne's brother Paul was born the same year, three sisters would follow. In 1834, at the age of six, Verne was sent to boarding school at 5 Place du Bouffay in Nantes. The teacher was the widow of a naval captain who had disappeared some 30 years before, she often told the students that her husband was a shipwrecked castaway and that he would eventually return like Robinson Crusoe from his desert island paradise. 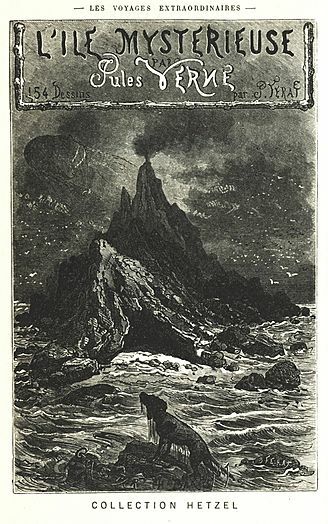 The theme of the Robinsonade would stay with Verne throughout his life and appear in many of his novels, including The Mysterious Island (1874), Second Fatherland (1900), and The School for Robinsons (1882). In 1836, Verne went on to École Saint‑Stanislas, a Catholic school. 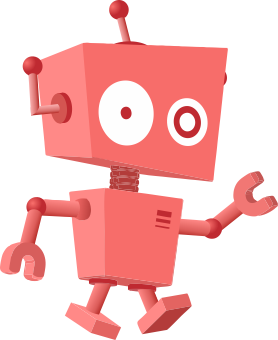 Verne quickly distinguished himself in mémoire (recitation from memory), geography, Greek, Latin, and singing. In 1840, the Vernes family moved to a large apartment at No. 6 Rue Jean-Jacques-Rousseau. In the same year Verne entered another religious school, the Petit Séminaire de Saint-Donatien. From 1844 to 1846, Verne and his brother were enrolled in the Lycée Royal (now the Lycée Georges-Clemenceau) in Nantes. After finishing classes in rhetoric and philosophy, he took the baccalauréat at Rennes and received the grade "Fairly good" on 29 July 1846. 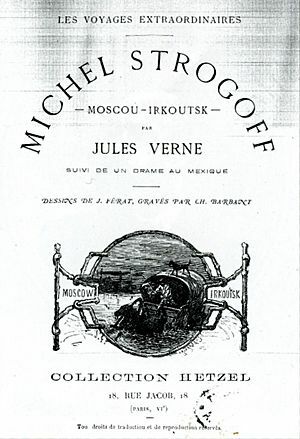 By 1847, when Verne was 19, he had taken seriously to writing long works in the style of Victor Hugo. However, his father took it for granted that Verne, being the firstborn son of the family, would not attempt to make money in literature but would instead inherit the family law practice. In 1847, Verne's father sent him to Paris, primarily to begin his studies in law school. 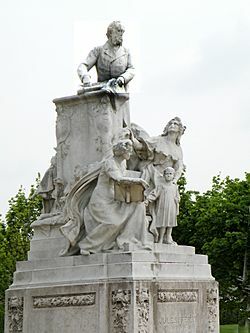 After a short stay in Paris, where he passed first-year law exams, Verne returned to Nantes for his father's help in preparing for the second year. While in Nantes, he met Rose Herminie Arnaud Grossetière and fell intensely in love with her. He wrote and dedicated some 30 poems to her, but Grossetière's parents frowned upon the idea of their daughter marrying a young student of uncertain future. They married her instead to a rich landowner. In July 1848, Verne left Nantes again for Paris, where his father intended him to finish law studies and take up law as a profession. He rented a furnished apartment at 24 Rue de l'Ancienne-Comédie, which he shared with another student of Nantes origin. Verne used his family connections to make an entrance into Paris society. His uncle introduced him into literary salons. While continuing his law studies, he fed his passion for the theatre, writing numerous plays. Though writing profusely and frequenting the salons, Verne diligently pursued his law studies and graduated with a licence en droit in January 1851. During this period, Verne's letters to his parents primarily focused on expenses and on a suddenly appearing series of violent stomach cramps, the first of many he would suffer from during his life. Rumors of an outbreak of cholera in March 1849 aggravated these medical concerns. Yet another health problem would strike in 1851, when Verne suffered the first of four attacks of facial paralysis. These attacks, rather than being psychosomatic, were due to an inflammation in the middle ear, though this cause remained unknown to Verne during his life. In the same year, Verne was required to enlist in the French military, but the sortition process spared him, to his great relief. Verne's strong antiwar sentiments, to the dismay of his father, would remain steadfast throughout his life. Thanks to his visits to salons, Verne came into contact in 1849 with Alexandre Dumas. Verne became close friends with Dumas' son, and showed him a manuscript for a stage comedy. The two young men revised the play together, and Dumas, through arrangements with his father, had it produced by the Opéra-National at the Théâtre Historique in Paris, opening on 12 June 1850. 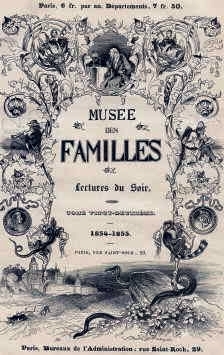 In 1851, Verne met with a fellow writer from Nantes, Pierre-Michel-François Chevalier, the editor-in-chief of the magazine Musée des familles (The Family Museum). He was looking for articles about geography, history, science, and technology, and was keen to make sure that the educational component would be made accessible to large popular audiences. Verne, with his delight in thorough research, especially in geography, was a natural for the job. Verne first offered him a short historical adventure story, "The First Ships of the Mexican Navy". Pitre-Chevalier published it in July 1851, and in the same year published a second short story, "A Voyage in a Balloon"(August 1851). Verne worked on the idea of a Roman de la Science, which he developed in a rough draft inspired, according to his recollections, by his "love for maps and the great explorers of the world". It took shape as a story of travel across Africa and would eventually become his first published novel, Five Weeks in a Balloon. In May 1856, Verne traveled to Amiens to be the best man at the wedding of a Nantes friend. Verne, invited to stay with the bride's family, took to them warmly and found himself attracted to the bride's sister. Hoping to find a secure source of income, as well as a chance to court her, he jumped at her brother's offer to go into business. Verne's father was initially dubious but gave in to his son's requests for approval in November 1856. With his financial situation finally looking promising, Verne won the favor of his future bride and her family, and the couple were married on 10 January 1857. Verne plunged into his new business obligations, leaving his work at the Théâtre Lyrique. Verne woke up early each morning so that he would have time to write, before the day's work. He also continued to do scientific and historical research, much of which he copied onto notecards for future use—a system he would continue for the rest of his life. In July 1858, Verne seized an opportunity: a sea voyage, at no charge, from Bordeaux to Liverpool and Scotland. The journey, Verne's first trip outside France, deeply impressed him, and upon his return to Paris he made into fiction his recollections. A second complementary voyage in 1861 took Verne to Stockholm, from where he traveled to Christiania and through Telemark. 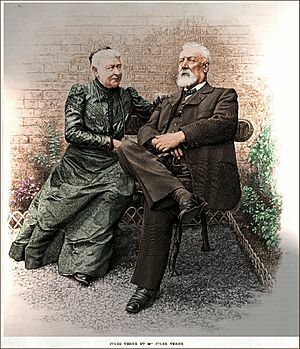 Verne left Denmark to return in haste to Paris, but missed the birth on 3 August 1861 of his only biological son, Michel. 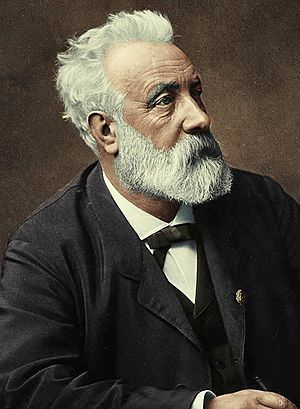 Michel Verne would eventually marry an actress against his father's wishes and have two children. He ended up buried in debts. The relationship between father and son improved as Michel grew older. In 1888, Verne entered politics and was elected town councilor of Amiens, where he championed several improvements and served for fifteen years. Verne was made a Chevalier de la Légion d'honneur in 1870. He was promoted to an Officier de la Légion d'honneur in 1892. On 24 March 1905, while ill with diabetes, Verne died at his home in Amiens, 44 Boulevard Longueville (now Boulevard Jules-Verne). 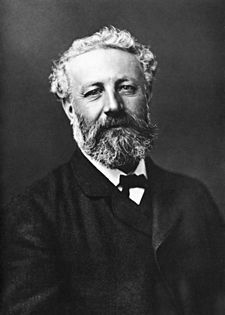 His son, Michel Verne, oversaw publication of the novels Invasion of the Sea and The Lighthouse at the End of the World after Jules's death. 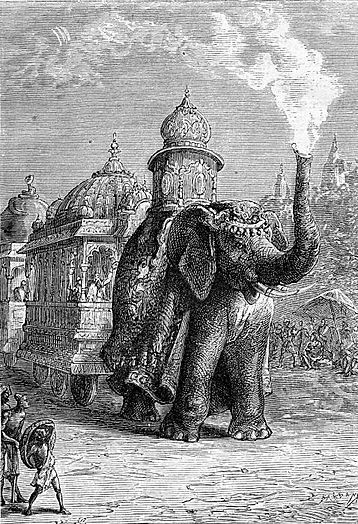 The Voyages extraordinaires series continued for several years afterwards at the same rate of two volumes a year. 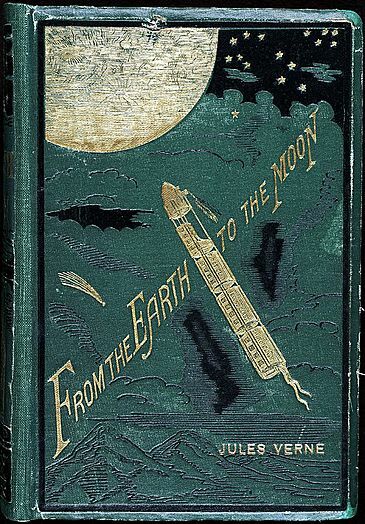 It was later discovered that Michel Verne had made extensive changes in these stories, and the original versions were eventually published at the end of the 20th century by the Jules Verne Society. In 1919, Michel Verne published The Barsac Mission, which original drafts contained references to Esperanto, language about which his father had great interest. In 1989, Verne's great-grandson discovered his ancestor's as yet unpublished novel Paris in the Twentieth Century which was published in 1994. 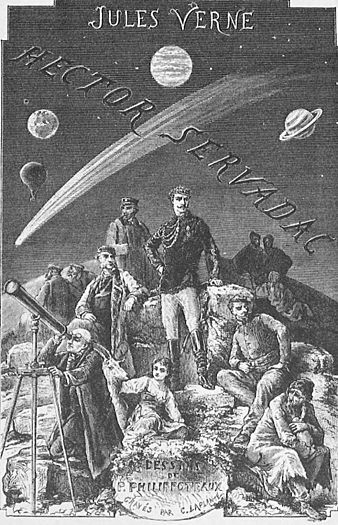 The decades after Verne's death saw the rise in France of the "Jules Verne cult", a growing group of scholars and young writers who took Verne's works seriously as literature and willingly noted his influence on their own works. 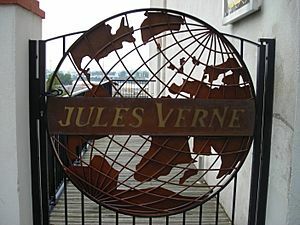 Some of the cult founded the Société Jules Verne, the first academic society for Verne scholars. Verne's novels have had a wide influence on both literary and scientific works. He is credited with helping inspire the steampunk genre, a literary and social movement that glamorizes science fiction based on 19th-century technology. An illustration from Jules Verne's novel "The Carpathian Castle"
Jules Verne Facts for Kids. Kiddle Encyclopedia.